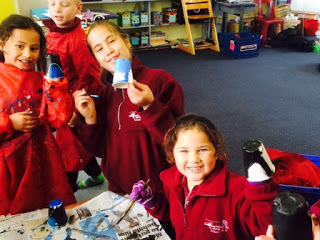 After morning tea we split into three groups; burrow construction, arts and crafts, penguin science and research. During the morning all of the children had completed all 3 workshops. Many thanks to Whaea Jenni Scothern and Matua Arthur who came to support our tamariki during the day. It is always amazing, the resources and energy people bring to Te Mahia School and the engagement and motivation our tamariki show. There will be a display in town in the Hammer Hardware front window of all of todays learning. Do watch out for it!